Model object. Collections. Delegate pattern, using a picker view. Calculations. Fun. 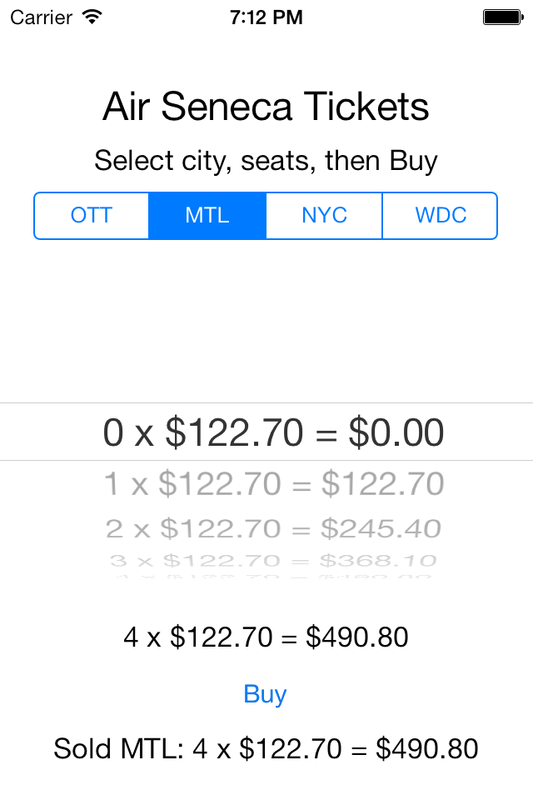 You need an iOS app that enables a user to “buy” air travel tickets. The “Air Seneca” airline has flights from Toronto to Ottawa, Montreal, New York City, and Washington D.C. 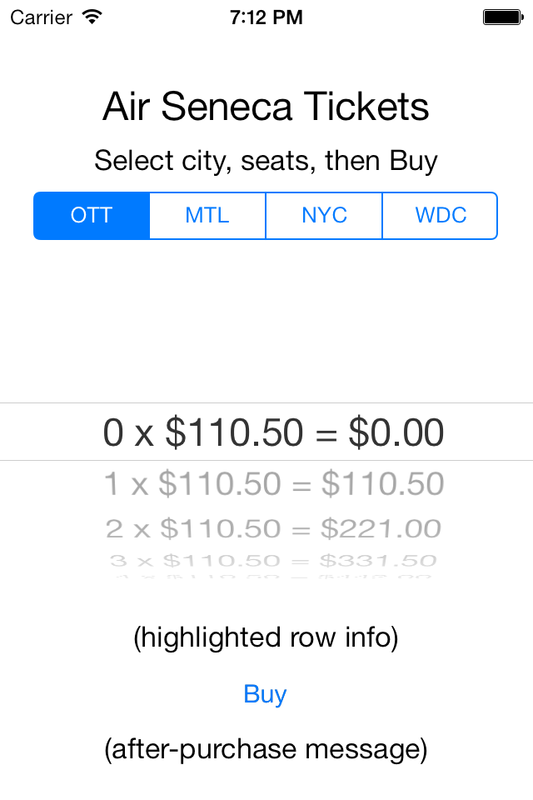 The app enables the user to 1) select the destination city, 2) select the number of tickets, and 3) “buy” tickets. A segmented control enables the user to select the flight destination. A picker view enables the user to select the number of tickets to purchase for the flight. The data shown on the picker view is generated when the app launches, and also when the user taps a different segment on the segmented control. When the user swipes the picker view, and the ‘spinning wheel’ stops spinning (and comes to rest on one of the rows in the picker view), the selected row is displayed in a message below the picker view. The “Buy” button will reduce the number of seats available on the flight by the selected number, and generate a ‘buy message’. Get started by creating an iOS app, using the “Single View Application” template. Its name should be “Air Seneca”. Alternatively, you can use the ‘template’ that has been posted in the new “Project_Templates” folder in the code example repository. First, you will work on the Model class. Then, you can work on the user interface. Finally, write code in the controller. Work incrementally, and test your work step-by-step. Read through this assignment fully before starting work on it. That way you will know what’s coming. The seatsAvailable array can be initialized with the same int value for all four elements – 40. So… you have noticed that there are four elements in each of these arrays. That matches the number of destination cities. You will maintain a logical association between the segmented control’s selected segment index and the index of each array. 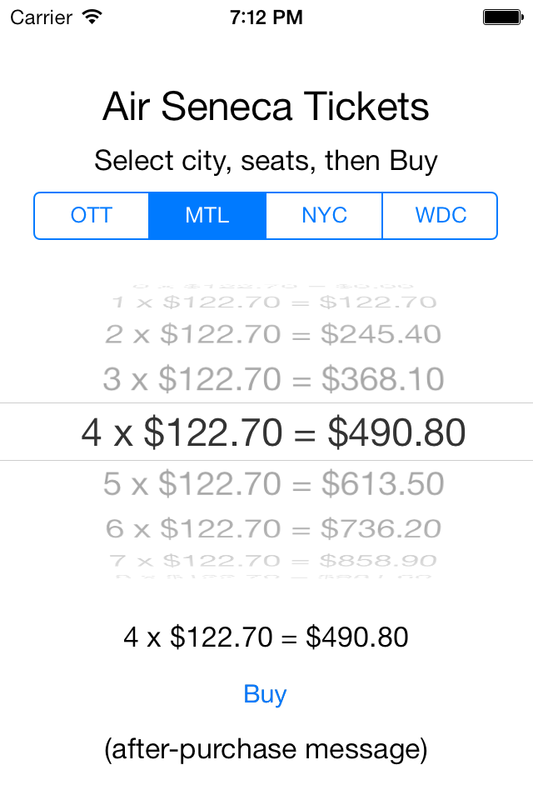 In other words, if the selected segment index is 2, then you are working with the New York City destination, and therefore you will get its ticket cost from the ticketCost array’s index 2, and its seats available from the seatsAvailable array’s index 2. Important: In the “for” loop that builds the array elements, include the zero (0) seats calculation. That enables you to easily show that a flight has been ‘sold out’ and has no more tickets available. Therefore, your upper condition will be less-than-or-equal-to the seats available on the flight. As suggested by the screen capture to the right, create the user interface. Segmented control – outlet and action, named flightNumberChanged. Picker view – outlet; and connections for its delegate and dataSource properties. Label – outlet – displays the content of the array element at the selected index. Button – action, named buyTickets. Label – outlet – displays an after-purchase message. Select the picker view in the scene. Then Control+click-drag to the “View Controller” icon on the scene’s dock. On the popup, select “delegate”. Repeat this, and on the popup, select “dataSource”. Finally, add code to the controller’s interface to ‘formally adopt’ the picker view’s delegate and data source protocols. Here is the code that you must write for the controller methods. Call the model object’s generate picker rows method for the flight number as indicated by the currently-selected segmented control segment. Also, if the labels have placeholder text, clear them now, so that the user interface is clean. This will run when the user taps the segmented control to change their selection. Call the picker view’s method to reload all components. Look in the UIPickerView class reference for the appropriate method. Then, it would be nice to make sure that the picker view ‘spins back’ to show the first row. Look for a UIPickerView method that selects a row in a component using animation. This will run when the user taps the Buy button. Get the selected row in the picker view. There’s a method for that, which returns an int. Then use this value to get the data from the model object array. Use [NSString stringWithFormat… to compose a nice-looking message. Next ‘buy’ the tickets. Call the model object method to do that. Then, call the model object method to re-generate the picker view data source. Finally, call the picker view’s method to reload all components. As before, ‘spin back’ to show the first row. There’s only one component. Return 1. Return the number of rows in the model object’s array that holds the picker view data rows. Return the string that’s in the data source, which is the appropriate model object array at the ‘row’ index. This method will simply set the UILabel with the string in the data source array (at the ‘row’ index).